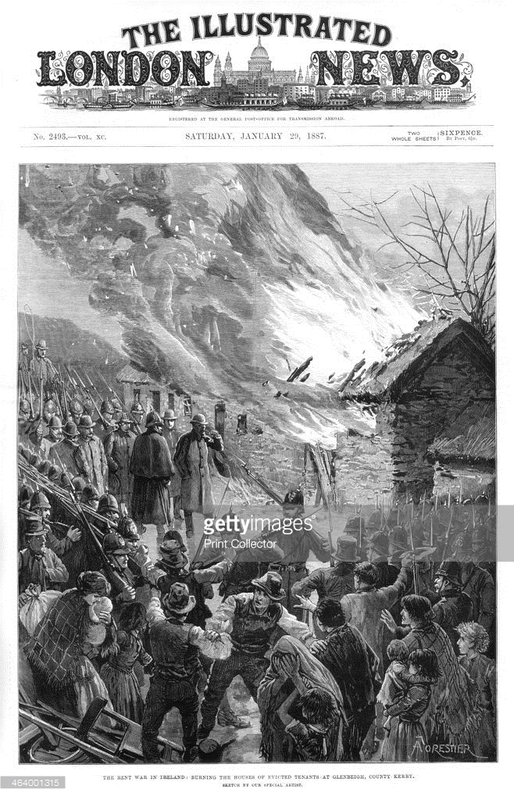 Burning tenant’s houses at Glenbeigh. 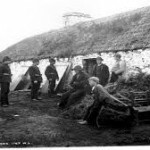 One of the most infamous evictions to take place in Kerry was that from Glenbeigh in January 1887. One of my readers – John O’Connor has alerted me to the published sources which give us a rounded view of what took place in that part of the county. John’s own Great GrandUncle is the John (Ned) Connor evicted and mentioned below. I am copying an excerpt from Illustrated London News January 29, 1887, reprinted by Maggie Blanck. Evictions took place at Glenbeigh, County Kerry on the estate of “the Honorable” Rowland Winn in January 1887.The estate was located midway between the towns of Killorglin and Cahireiveen. The rents brought in about 1,600 pounds a year. It was said that no rent had been paid for at least five years, some as long as seven or eight. The people had no real way of making an income and were in a chronic state of poverty. The men migrated at harvest time as farm laborers. Occasionally money was sent by sons and daughters living in other places, like America. Various attempts were made to come to some agreement on how much rent would be paid, but the negations kept falling through. Eventually on Wednesday the 12th of January a party made up of the sub-sheriff’s deputy, four bailiffs, the land agent Mr. Roe, and six emergency bailiffs from Dublin, set out to execute the evictions. They were accompanied by a force of fifty policemen. Despite the fact that the evicting party started their work at the earliest possible hour allowed by law, the locals were aware of what was happening and so gathered in large crowds to watch. It was reported that 10 houses were destroyed under the auspices of Winn’s agent Mr. Roe. 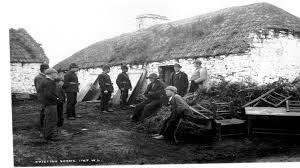 The first eviction was at the house of Patrick (Paddy) Reardon of Droum in the wild glens three miles from Glenbeigh. He barely had time to remove the furniture from his house when a match was set to the roof. The door was hacked with a hatchet and the walls were felled with crow bars. Next was a joint property of Patrick and Thomas Diggins. Patrick Diggins had eight in his family (a wife and six children) and Thomas Diggins had ten (a wife and eight children) the youngest only three weeks old. They lived in separate but adjoining house that had been build by their father; the landlord contributing nothing. They were joined by one tenancy. Thomas had no livestock. Patrick had two cows. Patrick sold one of his cows and with a little help from a daughter in Limerick was able to offer agent Roe some money. Agent Roe did not accept the offer because Thomas was not able to meet his share. 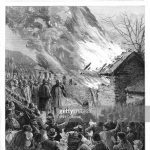 A match was put to the roof and then the sheriff’s representative departed leaving the agent to watch the burning of both houses. So now there were 18 more people without shelter in the middle of the winter. Among the evicted and now homeless were Patrick Diggins “an old man of eighty”, his wife and their “little grand-child”.” Patrick Diggins had “suffered” eviction three times. He had been evicted in 1884 but returned to his property after a while. On the second day of evictions John (Ned) Conner, age 65 with a family of seven and some children in America was evicted. Paraffin was used to start fires in the thatch roof. Crowbars were used to demolish the corner of the cable until the side walls and the burning roof came tumbling down. The cow barn beside the house was also levered – making sure there was no available roof over the tenants heads. Read More. Very interesting but not sure of any relationship. Great grandfather was Michael Patrick Diggin (no S ) from Killorglin. Married to Julia Diggin.